The other day I was reading this blog about custom cabinets, and how they can be truly custom, even though they are not made locally. Now I certainly cannot disagree, however, I would like to talk about the advantages of custom cabinets that are made locally. In this blog, I want to give my opinion of buying local custom cabinetry versus ordering cabinets online or through a vendor, and the advantages of working with a custom cabinet shop. In future blogs, I will be discussing how cabinets are made and comparing to semi-custom cabinets. Artisan Cabinet Company is a locally owned custom cabinet shop located in the small town of Chaska, Minnesota. We make kitchen cabinets, bathroom vanities, entertainment centers, and even custom commercial pieces. If you can think of it, we can build it. So, why buy local? Well, it starts with working with a team of individuals who you will have the opportunity to get to know you. This will start with your first phone call with our in-house consultant. Our consultant wants to know about you and your home. Such as, what are your goals for custom cabinetry, and about the space the cabinetry is going to be placed in. From the phone call with the consultant, the next step is an in-home consultation. This in-home meeting will take place with our design consultant, or our cabinet maker, or at times both. Our goal at this meeting is to continue to learn about you, your home and your design style. Our purpose in the end is to build your custom cabinetry for you. We want to design, build, and install your custom cabinetry that will make a lasting impression on your home for years to come. When building a truly custom cabinetry we can build the cabinets to your exact specifications, that we are responsible for making sure this is completely accurate. These specifications can be built to the height, depth, and width as needed. These specifications can even be built down the 1/16” of an inch. Most semi-custom cabinets are built in 3” increments. To get a cabinet built increments other than 3” usually incurs an upcharge. In the end you may be paying more for these changes than you would with a custom cabinet shop. 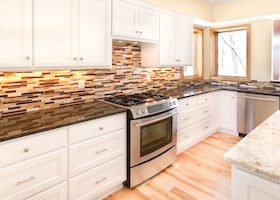 If you are looking to have new cabinetry added to your home give Artisan Cabinet Company a call at, 612.235.4873. Stay tuned for our next blog we will be talking about how our cabinets are made and discuss how semi- cabinets are made.